This doll was given to me by my grandmother. She grew up in the 1920's. I thought she told me that this doll had been her mother's but I could be mistaken. The cradle is wicker, is appx. 4" long and is in perfect condition. The doll is appx. 3" long, appears to be bisque. It has moveable joints and is also in nearly perfect condition. The doll is wearing a Christening gown that is perfect aside from slight yellowing from age. The doll is wearing matching socks with small ribbons and a diaper with a small safety pin. 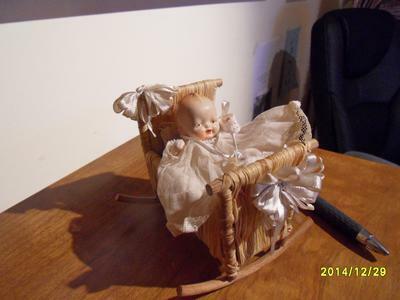 The only identifying markings I found are on the doll (not on the cradle). They are A87 Made in Japan. I have no plans to sell, but I'm curious about the doll and I'd like to know more about it and its probable value.